The following is a natural extension of the previous article on Israelite history. In that article week we covered the biblical history of the people of Israel from 1400 to 333 BC. Now, let's broaden that considerably geographically and time wise and try to understand the surrounding culture that the people of Israel evolved from. We mentioned that we might want to attempt to look at the Torah through different lenses than we normally do. Two of those new lenses could be cultural and literary. Those two go hand in hand because our predominant means for understanding ancient cultures is the study of ancient literature. Not only what the literature was, but how it was understood in ancient times. And I will say again that we miss a great deal in understanding ancient literature if we try to read it through modern understandings. So let’s start talking about the ancient near east and eventually we will talk about it from a literary standpoint. The Ancient Near East is divided into three major geographical regions: Egypt, to the west, Canaan, in the middle, and Mesopotamia, to the east. All of these are important for understanding the Bible in general and the book of Genesis in particular. Why do I say that? Consider this. The key patriarchs discussed in Genesis are Abraham, his grandson Jacob, and Jacob’s son Joseph. Abraham is born in Mesopotamia, in fact the bible records that he did not leave Mesopotamia until he was 70 years ago. So he was completely immersed in Mesopotamian culture in his formative years. He then migrated to the land of Canaan, and spent time in Egypt during a period of famine. His grandson Jacob is born in Canaan, but fled back home to Mesopotamia for 20 years, then returned to Canaan and then spends the end of his life in Egypt, where he eventually dies. His son Joseph is born in Mesopotamia, moves to Canaan with his family at a young age, but then spends his entire adult life in Egypt, where he dies. So the book of Genesis is an incredible travel tour of the ancient near east. "Near East" is the term scholars use to refer to the area where Asia, Africa, and to some extent Europe all come together. Ancient refers to the period from c. 3000 B.C., when our written records first begin, though 333 B.C.E., at which point we move to the Greco-Roman period, also called late antiquity. Egypt, which is really the Nile valley, home of the Egyptians, contained mainly a homogeneous population. Mesopotamia, the Tigris and Euphrates valley, contained, in contrast to Egypt, a very heterogeneous population: it was the home of the Sumerians, Babylonians, Assyrians, Hurrians, and others. Canaan, the land in between the two great powers listed above, in which lived the Canaanites and the Israelites, might be called "the third world" of ancient times. Canaan has rather amorphous boundaries; basically, we define it as the area bounded by the shore of the Mediterranean to the west and the Syrian Desert to the east. There are also three regions beyond the main Near East that have a role to play in biblical history: Persia (modern Iran), Greece, and Arabia. We normally do not spend much time on economic or trade matters in our bible studies but it sometimes helps understand the stories if we know how people moved about. A slightly different view – this time to show the major International travel and trade routes that were in place in biblical times. There were two main highways in ancient times between Mesopotamia, Egypt, and the lower Arabian Peninsula: the King’s Highway and the Way of the Sea. 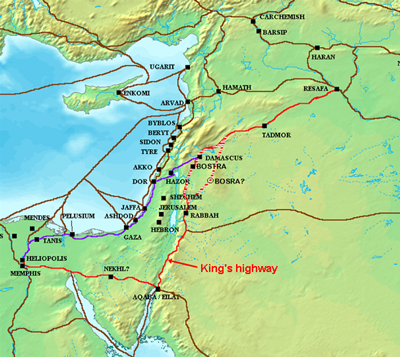 The King’s Highway largely skirted the desert and served desert peoples. It ran from Damascus to the Gulf of Aqabah, and from there it forked into a route that crossed the Sinai to Egypt and a route that ran the eastern coast of the Red Sea into the Hejaz, or western Arabic coastal region. While the term appears often in historical records, it may have originally meant simply "royal road" or "principal highway", with no connection to a particular king or kingdom. The King’s Highway has always been an important road for pilgrims, traders, and conquerors. The Bible records it as the route that Moses and the "children of Israel" might well have taken after they fled from ancient Egypt. Most likely it was the path that Abraham used to pursue the desert kings who had taken his nephew Lot as hostage. Throughout later history the King’s Highway was a crucial resource for kings and generals. On this highway David and Solomon secured trade and leverage over their eastern neighbors, Moab and Edom. When the Aramaeans arose under Ben-Hadad I and Hazael, they expanded southward by controlling this highway. The people of Assyria took Damascus and the Transjordan by means of it, and centuries later the Nabataeans used the King’s Highway to ship their spices and luxury goods from their hideaway refuge in Petra to the markets of Damascus and beyond. Around the turn of the millennium Rome entered the area and subjugated Nabatea a century later. The Romans made the King’s Highway a part of their imperial road system, especially using it as a means of transport through the forbidding Arab deserts. They called it the Via Nova Traiana (Trajan’s New Way) because of Trajan’s sponsorship. Its strategic value did not end when the area was traded off between Byzantines, Arabs, Persians, and Muslims. Because of the requirement for pilgrimage (hajj), the road became even more important for Bedouins and northern Arab Muslims for travel to Mecca and Medina. Only in the 16th century did the Ottomans develop an alternate route. The crusaders fortified the highway at the turn of the next millennium, and their castles are still imposing landmarks in the modern Jordanian villages along the way. Today the route is called Tariq es-Sultani (Way of the Sultan). Ancient road builders left traces along the highway, from the Roman milestones to the crusader castles. Even today villages of the modern state of Jordan mark its path. The King’s Highway follows the highlands and ridges east of the Jordan and the Dead Sea, and some of the most spectacular desert scenery in the Middle East greets travelers. Freshwater springs flow at various places and so explain the popularity of the King’s Highway. The Way of the Sea was the principal coastal highway and the one most chosen by traffickers between Mesopotamia and Egypt. The reasons are simple: It was close to water, food sources, and towns and avoided the highlands. Damascus was the northern junction, and the path went from there to the Sea of Galilee, then through Jezreel Valley and Megiddo, reaching the Mediterranean coast and following it until Zoan in northern Egypt. Various parties controlled the Way of the Sea. At first it fell under the inﬂuence of the Egyptians (and was called the Way of Horus in ancient sources), then under the Philistines (called the Way of the Land of the Philistines in the Bible), and finally under the Romans (who called it Via Maris, Way of the Sea). There were three main sites of strategic importance along the Way of the Sea: Gezer along the southern section of the road in the area contested by the Egyptians and the Philistines; Megiddo in the central section guarding the fertile Jezreel Valley, and Hazor in the north, where the road forked toward the city-states of the Phoenicians in the northwest or toward Damascus in the northeast. The point here is again that the people of Canaan did not live in a vacuum – travelers from both Mesopotamia and Egypt traversed through Canaan as part of the economic activity of the times.